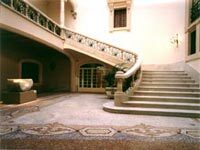 Palma's most renowned art gallery contains works collected by the Juan March Foundation, housed in a restored mansion on the Carrer Sant Miquel. The collection focuses on modern works including Picasso's Head of a Woman and paintings by acknowledged masters like Miro, Dali, Juan Gris and Antoni Tapies, as well as art by contemporary Spanish artists. It is a small but impressive collection and the 17th-century mansion that houses it is in itself beautiful and fun to explore; the old building contrasts interestingly with the modern art. The spacious, quiet, air-conditioned gallery is a wonderful refuge on a hot day. The museum is very active, organising lecture series, many temporary exhibitions, and art workshops which visitors are welcome to participate in free of charge. Guided tours of the gallery are available by prior appointment on week days between 11am and 3pm. There is a good museum shop selling exhibition catalogues, art books, posters, postcards and the like. The gallery is wheelchair accessible. The fact that a gallery of this calibre is free is quite remarkable and the museum is popular with tourists and locals alike. Opening times: Monday to Friday from 10am to 6.30pm, Saturday from 10.30am to 2pm, closed on Sundays and public holidays.